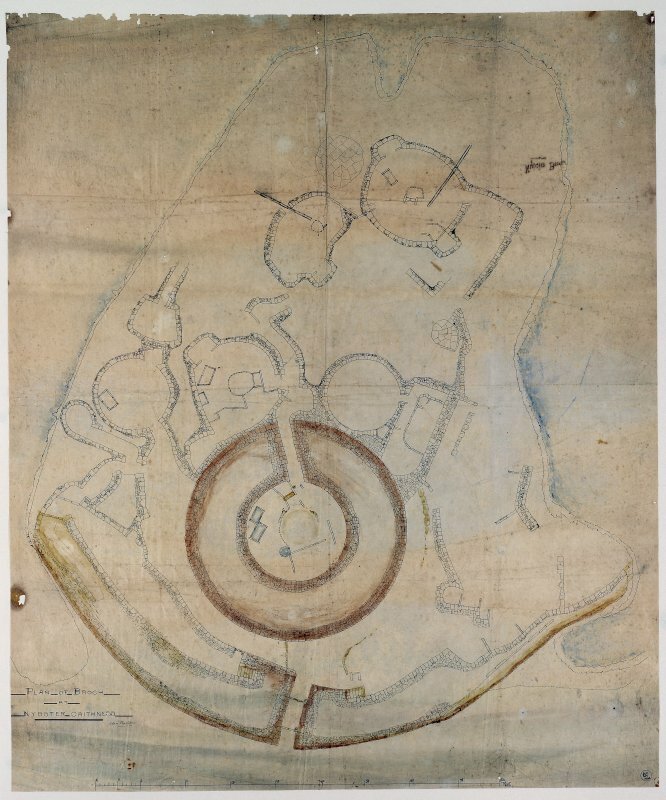 Scanned image of a drawing of a broch in plan, entitled: 'Plan of Broch at Nybster, Caithness'. Description Scanned image of a drawing of a broch in plan, entitled: 'Plan of Broch at Nybster, Caithness'. Scope and Content Plan of Nybster broch, Caithness, Highland Nybster broch lies on a sheer-sided coastal promontory in north-east Caithness and was excavated by Sir Francis Tress Barry (1825-1907) in 1895-96. The site can only be approached from one direction and is defended by a massive outer wall. Outbuildings fill the whole of the promontory around the broch tower. A local factor, John Nicolson (1843-1934), supervised the excavations. He also drew the site and a number of the recovered artefacts. Nicolson used watercolour to designate the thickness of walls and ink to illustrate stonework. Nicolson was a skilled sculptor and artist with a keen interest in the archaeology of Caithness. He lived at the 'Half-Way House' only a few minutes walk from the broch and assisted Barry in his excavations at the site. The broch can still be seen today and is marked by a monument built by Nicolson to commemorate Barry's excavations. Source: RCAHMS contribution to SCRAN. >>> Item Level (SC 877283) Scanned image of a drawing of a broch in plan, entitled: 'Plan of Broch at Nybster, Caithness'.